Stormpfund Barrow is a medium-sized burial ground just west and a bit north of Fort Frostmoth. 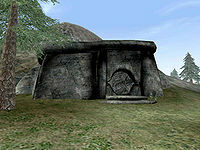 It is guarded by bonewolves, greater skeleton champions, or draugr, depending on your level. It has three treasure chests of loot and one piece of raw stalhrim. The treasure chests contain miscellaneous random items, including potions and ingredients, armorer's hammers, many magic weapons, items and armor, and possibly a glass longsword. There a small chance that the Insane Wanderer spawns here. She is a level 99 Dunmer barbarian that turns into a werewolf between 9 pm and 6 am. This page was last modified on 14 July 2013, at 18:20.